The best definition of a gap analysis can be given by describing the process. A gap analysis is a process that airlines and airports use to determine what steps or elements are missing in from a desirable state of existence. In our case, we want to comply with ICAO (civil aviation authority) requirements for a formal aviation safety management system. Your gap analysis will start with a gap analysis model, depending on your preference an industry. For example, if you have IS-BAO auditors coming to review your operations, you would want to base your "desirable state" on IS-BAO requirements. These models are made up of sections and each section commonly has three or more questions or statements. You will then answer these questions or statements based on your subjective understanding of your aviation operations and ALSO your understanding of the question. The gap analysis module was one of the first aviation SMS software tools that made it into the Web based SMS Pro™. In the beginning, Southern California Safety Institute (SCSI) provided subject matter expertise in the development of SMS Pro™. SCSI provided SMS Pro™ the first gap analysis model that was included in the Web based safety software. As the years passed, more gap analysis models found their way into SMS Pro. For two years, (Dec 2010 to Dec 2012), SMS Pro staff provided free gap analysis software to airlines and airports around the world. Over 880 airlines and airports signed up to take advantage of this free gap analysis software. 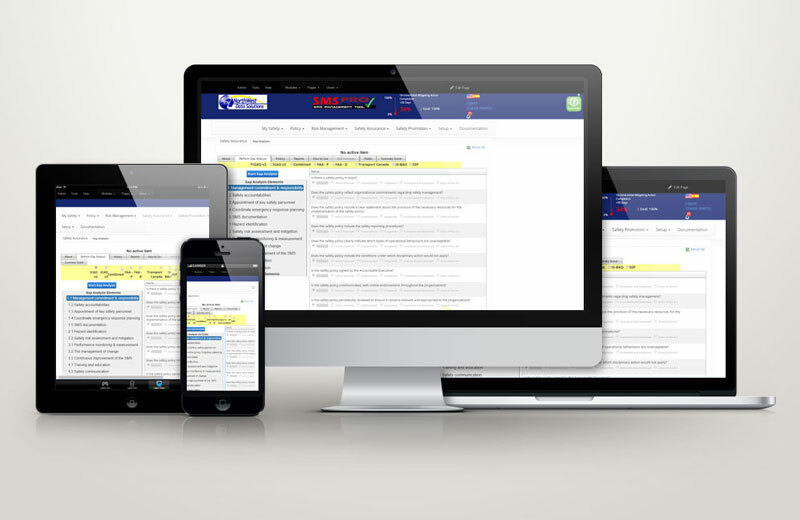 SMS Pro™ has the most sophisticated gap analysis tools of any of the aviation safety management software systems. The gap analysis allows airlines and airports to conduct a self-audit against a set of best practices. After completing the gap analysis, the safety management team will prepare an SMS implementation plan that addresses the shortcomings. For all intents and purposes, a gap analysis is an internal audit. Your airline or airport is conducting a self audit using the checklists provided by an aviation safety management system model. These models are commonly prepared by civil aviation authorities and can be used as a pre-audit checklist to prepare your team for an aviation SMS audit. Airlines and airports should complete a gap analysis to identify any shortcomings they may have according the their chosen model. Not all models are equal. The IS-BAO gap analysis is very elementary and hardly worth the trouble of completing. If you have to complete the IS-BAO gap analysis, do it quickly and move onto the IS-BAO SMS implementation plan. The IS-BAO SMS implementation plan is outstanding and makes up for the poor gap analysis. Besides identifying gaps in your SMS program, the gap analysis is a great training tool. Managers can learn quickly what is required of a formal aviation safety management system by reviewing the questions in one of the better gap analysis models, such as Transport Canada and ICAO gap analysis models. SMS Pro also has an excellent gap analysis model provided by SCSI (Southern California Safety Institute). In many smaller organizations, the safety manager conducts the gap analysis. However, as the airline or airport operations become more complex, it is impossible for one person to be the subject matter expert for every area. In this case, it is recommended that safety managers enlist other managers to assist in preparing the gap analysis. One manager is in charge of the gap analysis and this manager will be in charge of compiling the results and preparing the final report. The gap analysis requires a model to serve as a base of requirements. The model is typically a checklist broken out into sections. The gap analysis is one of the first activities the safety manager should address when starting to implement the aviation safety management system. There is often a tendency to skip the gap analysis and skip directly to the SMS implementation plan. Try to resist this urge. The gap analysis model is much more thorough than every SMS implementation plan we have seen. After safety managers have completed the initial gap analysis, it is recommended that they immediately schedule another gap analysis for the following year. Each year, a gap analysis should be conducted and reviewed to monitor continuous improvement. As of 2012, the number of gap analysis templates or models has increased to five. To see a sample gap analysis template, we have these free gap analysis examples here. The Gap Analysis Tool allows organizations to conduct a regular gap analysis against regulatory standards to monitor continuous improvement. The application keeps track of each gap analysis and charts continuous improvement over time. A gap analysis helps operators uncover shortfalls in some process or characteristic. They are done against a template or model, such as SMS Pro's models adapted from various SMS guidance documents published in Canada, The United Kingdom and The United States. SMS gap analysis are often used to discover where to focus efforts on improvement. They compare characteristics of an organization's operations against an appropriate model. Gap analyses highlight areas where requirements of the model are not fully realized and details necessary changes. An initial gap analysis is the best starting point for implementing an SMS. From the initial gap analysis, management can create a "plan of action," with a time-line. These items can be managed in the Implementation Manager. Not every airline or airport will have funds available for aviation SMS gap analysis software. $100 per month may be more trouble than it is worth to get approval for the aviation safety management software and to get top management support. After all, you will need top management support to implement your aviation safety program. Safety managers can download these free gap analysis models and use these gap analysis models as either a sample, or as a gap analysis template to structure the model to suit your organization. There are three gap analysis sample templates available. Each of these sample gap analysis templates are embedded into SMS Pro, thereby allowing you to easily compare one gap analysis with others. The process of comparing your gap analysis will provide an exceptional way to demonstrate continuous improvement, which is a requirement of your aviation safety management system. These gap analysis checklists are examples and can be modified. These are the original examples, but you do not have to strictly follow these sample gap analysis checklists. Operators commonly adapt these example checklists to suit their type of operations, as there may be occasional questions that do not pertain to certain types of operators.